NitorAurora bundles the best procurement software with turnkey services designed for fast time-to-value results. 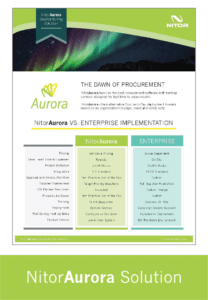 NitorAurora is the perfect mid-market source-to-pay solution for any organization looking to take the first step towards procurement transformation. 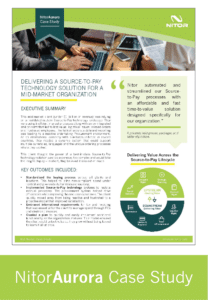 NitorAurora offers alternative deployment models based on an organization’s budget, need, size, complexity and vertical. The same tasks are required to deploy a project of any size. How long it takes, who performs the work and the complexity of the environment drives the implementation investment. By controlling those tasks while also applying our experience, we have a solution for an organization of any size.